Up to the mid 1960s, commercial handgun bullet design had not changed since the early 1900s. Handgun bullets were either full metal-jacketed or all lead. Lead bullets were roundnose or, less commonly, wadcutter or semi-wadcutter. Recovery of a full metal-jacketed bullet meant that the individual had been shot with an automatic pistol; an all-lead bullet of medium or large caliber indicated a revolver; a small lead bullet a .22. The 1960s saw the introduction of semi-jacketed soft-point and hollow-point bullets for both automatic pistols and revolvers and lead hollow-point bullets for revolvers. These bullets were usually lighter and driven at higher velocities than the traditional bullets. Of the new designs, the semi-jacketed hollow point has been the most successful. 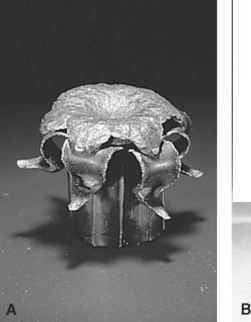 This bullet and the all lead hollow-point are designed to mushroom in the body, causing penetrating rather than perforating wounds, with loss of all their kinetic energy. The all lead hollow-point and the semi-jacketed soft point designs are uncommonly encountered nowadays. The semi-jacketed hollow-point configuration is gradually replacing both all-lead and full metal-jacketed bullets. Soon after their introduction, hollow-point handgun bullets became the center of controversy. Many civil libertarian groups protested that they were "Dum-Dum bullets," violated the "Geneva Convention," and caused severe and more lethal wounds. All these statements are incorrect. The Dum-Dum "bullet" was in fact a .303 centerfire rifle cartridge loaded with a soft-point style bullet manufactured at the British Arsenal at Dum-Dum, India, in the late nineteenth century. The "Geneva Convention" that outlawed Dum-Dum bullets was in fact the Hague Conferences of 1899 and 1907. The declarations issued at the conventions were applicable only to the use of expanding bullets in war. If one takes the declaration literally, even the all-lead bullets traditionally used by the police are outlawed. In regard to charges that hollow-point ammunition is "more lethal", in an unpublished study of over 75 fatalities from hollow-point ammunition by the author, he was unable to demonstrate any death that would not have occurred if the bullet had been an all-lead bullet. As to increased severity of wounding, this is purely theoretical. To this day, the author cannot distinguish a wound by a hollow-point bullet from that by a solid-lead bullet of the same caliber until recovery of the actual bullet. As the years have passed, semi-jacketed bullets of hollow-point design have, for the most part, replaced the traditional bullet designs. Except for wadcutters, all-lead revolver bullets are becoming uncommon. In the case of automatic pistols, full metal-jacketed bullets are still the rule only for calibers .25 ACP and .32 ACP. Medium- and large-caliber pistol cartridges are increasingly being loaded with semi-jacketed hollow-point bullets. Most police agencies now use this design. Figure 10.10 9-mm Silvertip® bullet. 9 mm, .38 ACP, and .357 Magnum are examples of cartridges that have the nickel-plated copper-zinc jackets. The first 1 1/2 year production of 9 mm used aluminum jacketing. Black Talon®. Produced by Winchester, this was a commercial success and a public relations nightmare. It was a line of pistol cartridges loaded with a hollow-point bullet having a distinctive black-colored copper jacket. The jacket was thicker at the tip than at the base with multiple notches such that when the bullet expanded in tissue it formed six, sharp triangular barbs (talons). If the bullet expands in the body, the x-ray picture is very characteristic (Figure 10.11). The pointed talons readily perforate surgical gloves if one is not aware of the nature of the projectile being recovered or if one is not careful. The news media went into a frenzy about this ammunition stating that the sharp "talons" were shredding organs producing devastating wounds. Because of the bad publicity, Winchester stopped production. In actual fact, the wounds produced are indistinguishable from wounds produced by solid and hollow-point bullets of the same caliber. Supreme® SXT®. Manufactured by Winchester, this appears to be the Black Talon® without the black color and pointed barbs. Hydra-Shok®. Manufactured by Federal, the cartridges are loaded with a semi-jacketed hollow-point bullet with a lead post in the center of the hol-lowpoint (Figure 10.12). The jacket is notched to further expansion. It is made in both revolver and pistol cartridges in calibers from .380 ACP and up. It is a favorite of many law enforcement agencies — both local and Federal. The recovered bullets often show remnants of the lead post in the mushroomed cavity. Figure 10.11 (A) Black Talon®; (B) x-ray of Black Talon. Figure 10.12 Mushroomed Hydra-Shok® bullet. Golden Saber®. This is a semi-jacketed hollow-point bullet with a thick jacket of cartridge brass, notched at the tip in a folded spiral configuration that allegedly promotes expansion and produces larger petals. It is manufactured by Remington. 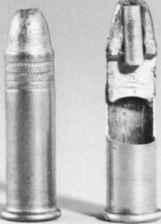 Introduced in 1974, Glazer rounds are loaded with a bullet consisting of a copper jacket, open at the tip, containing multiple small lead pellets rather than a solid lead core (Figure 10.13). The tip of this jacket is closed with a colored plug. The design and materials used to construct the plug have changed over the years. In current ammunition, the plug is spherical in shape. On firing, the Glazer "bullet" travels to the target just like a traditional bullet. On penetrating the target, the lead pellets force the plug out and emerge from the jacket, radiating outward in a fan-like manner and producing a shotgun pellet wound effect. This ammunition is readily identifiable on x-ray by the presence of both copper jacketing and pellets (see Figure 11.3). centerfire cartridges and one form for rimfire cartridges. 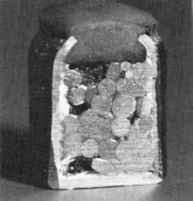 Ammunition initially manufactured for centerfire weapons used ordinary commercial semi-jacketed hollow-point ammunition in which the nose of the bullet had been drilled out. Into this cavity was placed black powder and a lead shot. The tip of the cavity was then sealed with a percussion cap. Because of federal regulations regarding black powder, a second form of exploding ammunition was introduced to replace the first. The black powder was replaced by Pyrodex®, a smokeless powder substitute for black powder and a pistol primer replaced the percussion cap. The third form of exploding ammunition is essentially the same, but no lead shot is used. 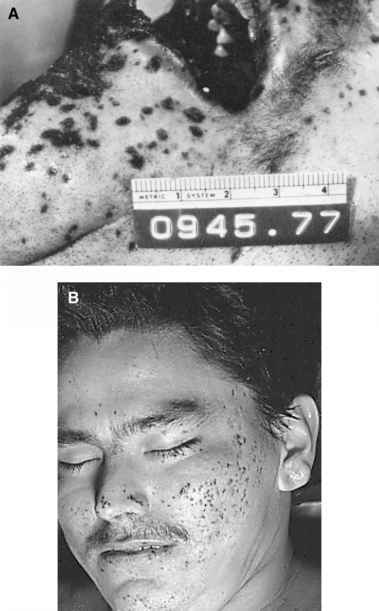 Evaluation of a series of individuals shot with this ammunition reveals that both the entrance wound and the wound tracks are indistinguishable from wounds produced by similar non-exploding ammunition of the same caliber.16 The fact that one is dealing with exploding ammunition may be determinable only on x-ray, as often the primer cap and primer anvil may be seen. President Reagan was shot with .22 Long Rifle exploding ammunition. This ammunition was constructed from ordinary commercially available .22 Long Rifle hollow-point ammunition. A hole was drilled in the tip of the bullet, with insertion of an aluminum cylinder. The cylinder was filled with an explosive mixture and sealed at its open end. The cylinder was inserted with the sealed end toward the base of the bullet (Figure 10.14). Originally, RDX explosive was used in the cylinder, but this was replaced with lead azide. Exploding ammunition is no longer commercially manufactured. This cartridge is a product of Geco, a division of Dynamit Nobel. Also known as the Action Safety Bullet, the cartridges are loaded with 86-gr. copper alloy hollow-point 9-mm Luger bullets.17 The primers contain neither lead nor barium. The nose cavity of the bullet is closed with a plastic nose cap, that has a plastic post at its base. This post inserts into a cylindrical channel that has been drilled from the base of the hollow-point cavity to the base of the bullet. The plastic nose cap gives a roundnosed shape to the tip of the bullet for reliable feeding from the magazine to the chamber. On firing, gas enters the channel in the base of the bullet propelling the plastic nose cone out of the hollowpoint cavity, down the barrel, ahead of the bullet. Because of an asymmetrical shape, the cap flies off at an angle to the trajectory of the bullet. The plastic post at the base of the bullet snaps off and flies separately from the body of the nose cap. Because of this, at close range, one may get three wounds: the entrance from the bullet; a circular abrasion or superficial penetrating wound from the cap and a punctate abrasion from the post. This constellation of injuries may extend out to two (2) meters. Pistol and rifle ammunition in which more than one bullet is loaded into a cartridge case has been produced by both civilians and the military. Figure 10.15 illustrates a .38 Special cartridge that has been loaded with four 50-gr. lead bullets. This ammunition was produced commercially. If an individual was shot at close range with this ammunition, there would be a single wound of entrance and four bullets in the body. At various times, handgun ammunition loaded with buckshot pellets has been produced. Figure 10.15 .38 Special round loaded with four 50-gr. bullets. Figure 10.16 Military duplex round. Note the canted base of bullet on right. bullet was 2800 ft/sec (850 m/sec), with the second bullet having a velocity of 2600 ft/sec (790 m/sec). 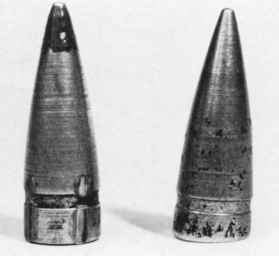 The canting of the second bullet's base was for the purpose of controlled dispersion. The M-198 cartridge had a green bullet tip for identification purposes.